This species is widely distributed across England and Wales but with only a few, widely dispersed records (mostly pre-1980) from Scotland. There is some indication that it is retreating from south-east England. Leiobunum blackwalli is much less common than L. rotundum (ranked 11th compared with 5th). Care is required when discriminating between these species (the key character of pale or dark ring around the eyes can be confusing). Identification is made even more difficult with the recent introductions of other Leiobunum species: L. gracile and the as yet unnamed L. sp.A. In Britain, Meade described this species in 1861 but did not specify a location for the first record. It is widespread across Europe (excluding the Mediterranean region), including Switzerland, Austria, southern Germany, Italy, the former Yugoslavia and eastern Ukraine. Wijnhoven (2009) notes that it has recently expanded into Poland, south Scandinavia, Denmark, the Baltic region of Latvia and northern Germany (Hamburg). In Britain this is predominantly a deciduous woodland species that, as with L. rotundum, prefers a multi-layered habitat. It also makes use of a wide range of other habitats, including parks and gardens, heathland, wetland, grassland and brownfield sites. Adults are found in June, peaking in September and persisting until March of the following year. It is not clear how long egg laying lasts. Philipson (1959) recorded the presence of juveniles between April and July. The early stages are found in the ground layers and they move higher up in the vegetation as they grow and mature, often being found on tree trunks and the foliage of bushes. In Britain they are found at altitudes of up to 385m but up to 800m in the Alps (Martens 1978). 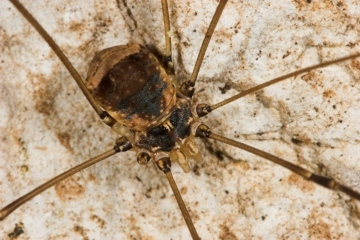 As with L. rotundum, L. blackwalli has been recorded feeding on a wide range of invertebrates including bugs, lepidoptera, diptera, millipedes, other harvestmen, earthworms and gastropods. Feeding on bird-droppings has also been noted. Common and widespread but some indication of range contraction in the south-east. Account last edited by Geoff Oxford at 09:14 on Thu 4th Oct 2018.